Late Brihaspati Parsai a.k.a Parsai Bajey was born on 30th June 1899 at Karkaley Pipaley village of Mechi district of Nepal. At the age of seven he lost his father Tikaram Parsai and two of his brothers due to chickenpox. In frustration, his mother decided to leave their original place and took 10 years old Brihaspati to the plains of Jhapa in Nepal. There young Brihaspati lost his mother due to malaria and became a total orphan. After hiding the corpse of his mother at a forest at a place called Chandragadi in Jhapa district, the young lad moved further east and reached Silagadi (now the place is known as Siliguri). He stayed at Silagadi for a year and thought of entering Sikkim. Coincidentally, he met a bullock carts’ caravan moving towards Sikkim and by pursuing it he reached lower Martam (32 Number the place is also called Middle Camp). It was at Martam the orphan met Chandrasingh Bhansari a Thikadar (Contractor) of Martam Estate who took him home and gave him the task of shepherd. Impressed by his truthfulness and diligence, the Thikadar gave one of his daughters Chulmaya in marriage to Brihaspati. After his marriage he bought a piece of land at Namli, a village near Ranipool and began to live a life of a householder. After the conclusion of First World War Sikkimese peasants also began to witness little development in their Kingdom. It was during this period the construction of auto able road from Siliguri to Gangtok commenced which is now known as NH 31 A. Brihaspati also began to work as a coolie in the construction process, and then he became a supervisor and finally a contractor. He was a founder member of Sikkim State Congress and also an educational enthusiast who had played a vital role for the foundation of Ranipool School at Ghattey Hill. His contributions and efforts for the foundation of said school will soon be updated in the blog. After the formation of Sikkim State Congress on 7th December 1947 late Parsai unconditionally threw him in politics. He became the Publicity Secretary of the newly founded Sikkim State Congress and began to raise his voice against the vices of feudalism like Kalobhari, Jharlangi, Theki Bethi, Kuruwa and Ghar-Lauri. In the beginning, the Central Office of Sikkim State Congress was raised at Rangpo. Due to his witty and mocking speech against the exploitation he was arrested during Satyagraha of 1949 at Rangpo and was put behind the bars for 62 days. Late Parsai played a vital role for the elimination of parity system from Sikkim. During agitation of 1973, he led a procession to the Sikkim Palace which was thence asking for one man one vote. The Chogyal Palden Thondup Namgyal coming out of the palace questioned late Parsai “What do you want?” He answered “We want the King, we do not want the Councillors, and we need Ministry, not one man six votes but one man one vote”. It is to be noted here that the greatest cause for dissatisfaction of the peasants during the agitation of 1973 was the notorious Parity System in Sikkim. During my field work I got an opportunity to meet one of his sons Mr. N. B Parsai an ex- teacher who also has a greater involvement for the development of Ghattey Hill School. He has informed me that his father was a person who always believed in the theory of Karma enunciated by the Upanishads. It is because of this philosophy of Upanishad he had been able to contribute a greater part of his life for the liberation of the Sikkimese subjects from the clutches of Kazism and Thikadarism. Many of his contemporaries have informed me that he was a brawny politician who used to speak as if he has nothing to loose in this world. Most of such contemporaries were inspired by his flamboyant speech consequently they joined late Parsai to uproot the evils of forced labour from Sikkim. This stalwart of Sikkimese politics died at the age of 80 on the evening of 9th June 1979 at his residence at Namli in East Sikkim. This winter I was busy with my fieldwork that gave me an opportunity to visit many villages and meet various people who had observed the reign of independent monarchs of our state. It was indeed a great experience for me to be there with the peasants who in the course of their contribution to the state are yet unknown to the history of Sikkim. I am talking here about those folks who are always in majority and have constantly made compromises for their survival and also have for eternity proven to be a backbone of a state’s economy by paying taxes. In lieu of their contribution in the form of tax, rents and free services they were cheated and were treated not better than a slave. Amid to their involvements to the state these peasants are not only ignored by the authorities but are sometimes even disregarded by the enlightened eyes of the historians and researchers. Hence, being a grandson of a peasant, I thought of writing a history of this “out-of-the-way” segment of the erstwhile Sikkimese society. While doing my survey I met many peasants who carried the most hatred Kalobhari, Jharlangi and worked in the fields of Kazi, Thikadars and Mandals as Bethi Khetala (a free service for three days in the field of Mandals and Kazis during cultivation). Their narration about the injustice they had faced has made me even stronger to write about them. They were just innocent, naive and childlike and due to their worrying nature they were severely exploited by the Kazis and other feudal machineries. Apart from my questionnaire, I have discussed with them in some other topics and also got other information about their day to day affaires. Interestingly, few people have shown me some antiques and documents related to their times of yore. The picture of today’s post is an old and a broken Hukkah (a untensil made up of brass to smoke tobacco mostly used in Northern India and Nepal) used by a person called Birdhoj Limboo of Namchi Rabitar somewhere in the first decade of 20th century. Later his family got migrate to Chota Singtam in East Sikkim and are at present living there. Presently, this Hukkah is being preserved by one of his grandsons Harka Bahadur Limboo who is now 85. According to him, this Hukkah originally belonged to his great grandpa who brought it from Nepal. It is to be noted here that the use of such items were marked as the symbol of prosperity in the earlier Nepali society. If we have to believe Harka Bahadur, then its year of origin goes back to 1870’s or 80’s. Now in almost broken condition this Hukkah is still bringing smiles on the face of Harka Bahadur who is keeping it with innermost respect as a souvenir of his ancestors. 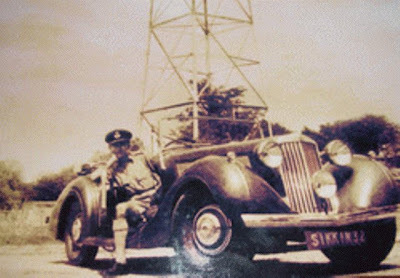 Prince Paljor Namgyal, the first and the only Pilot prince of Sikkim was born on 26thNovember, 1921 at the Royal Palace, Gangtok to the Eleventh Maharaja of Sikkim, Sir Tashi Namgyal, K.C.I.E, K.C.S.I. and Maharani Kunzang Dechen. His original name was Kunzang Choley and he was the eldest son of the Eleventh Royal Couple of Sikkim. In 1930, he was sent along with his younger brother, Prince Palden Thondup Namgyal and their sister Princess Pema Tsedeun to St. Joseph’s Convent, Kalimpong. Prince Palzor Namgyal was further educated at St. Paul’s School, Darjeeling and St. Joseph’s College, Darjeeling. The Crown Prince, Paljor Namgyal was commissioned as a Pilot Officer in the Royal Indian Air Force and based at Ambala. He served in World War II in 1940-41. As a true ally of the British Indian Government, Sikkim had greatly served in providing manpower in the said world war. It is to be noted here that many Sikkimese family had also send their children to fight against the English foes and few of them had been able to receive the esteemed Victoria Cross. But, most wretchedly, Paljor Namgyal was killed in active service after he crash landed in flight near Peshawar, on 20thDecember, 1941. He was merely 20 years old then. Regarding the death of the Crown Prince of Sikkim the Bharat Rakshak an official website of Indian Air Force has published this information “On 8th December, war was declared with Japan and the Squadron was ordered to the Burma front on 14th December. The Squadron returned to Peshawar two days later. As there was a shortage of air gunners, volunteers were called from among the fitters, riggers and other ground crew members. The airmen volunteered almost to a man. They were trained on a fast track basis in less than a fortnight. The Squadron suffered its first casualty on the Lysander on 20th December 1941, when Pilot Officer Paljor Namgyal, who at that time was the crown prince of the Kingdom of Sikkim, undershot trying to land at Peshawar. The aircraft R1989 hit a bund and overturned - killing the pilot and seriously wounding the observer”. The tragic death of the Sikkimese Prince has also been mentioned by PVS Jagan Mohan in his book ‘The Westland Lysander in Indian Air force Service’ in the following manner “The squadron suffered its first casualty on the Lysander on 20th December 1941, when Pilot Officer C Dhairyam, with Pilot Officer Paljor Namgyal as his passenger undershoot trying to land at Peshawar. The Air craft R1989 hit a bund and overturned - killing the pilot and seriously wounding the pilot. Palzor Namgyal was the Crown Prince of Sikkim and his death was a major blow to the people of the small Himalayan Kingdom”(P14). Most unfortunately, we have very little credentials about the pilot prince Paljor Namgyal. Few photographs that include his portrait in the Air force uniform are the only source to write something about him. During my fieldwork, I have been able to get a bit of unwritten information about the late Crown Prince of Sikkim. Few old Sikkimese, especially those who have seen him during their lifetime, have an immense respect and love for Paljor Namgyal. An old person Mr. Harka Bahadur Subba of Chota Singtam along with few old people has informed me that the Prince was a placid and a kind person. Once while hunting Prince Paljor reached to a house of an old Lepcha lady at Nandok in East Sikkim. She was unaware about his gigantic position and she offered Dhero (meal prepared from millet mostly consumed by the poor peasants during feudalistic Sikkim) to him for his dinner. He inquired about the poverty of the old lady and came to know about the forceful collection of Dhurikhajana and the prevalence of Kalobhari, Jharlangi and Theki bethi as forced labor. 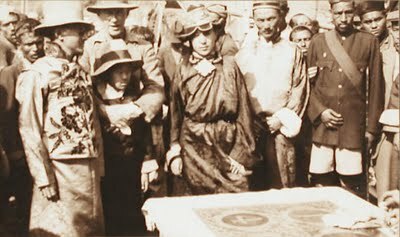 After spending a night at the home of the old lady the prince recoiled to his palace and informed his father Maharaja Tashi Namgyal about the utter poverty of their subjects and insisted him for the immediate removal of the forced labour and Dhurikhajana. Before the king could do anything in this regard, the Kazis and other feudal elements misguided the king to send his eldest son to join the Royal Air Force and was finally killed in an air crash. “Maharajkumar jyudo hunuhunthyo bhaney ta Sikkim aarkai hunthyo had the Maharajkumar been alive Sikkim could have been different” was their remark on the untimed demise of the late crown prince Paljor Namgyal.